The presence of strong evil registers on your senses like a noxious odor, and powerful good rings like heavenly music in your ears. As an action, you can open your awareness to detect such forces. Until the end of your next turn, you know the location of any celestial, fiend, or undead within 60 feet of you that is not behind total cover. You know the type (celestial, fiend, or undead) of any being whose presence you sense, but not its identity. Within the same radius, you also detect the presence of any place or object that has been consecrated or desecrated, as with the hallow spell. 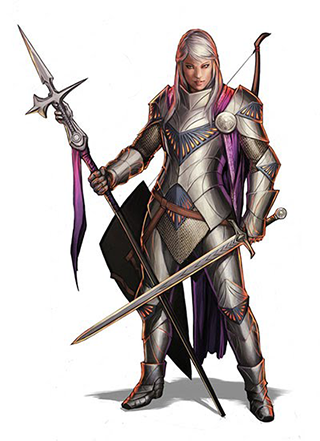 For example, if you are a 5th-level paladin, you have four 1st-level and two 2nd-level spell slots. With a Charisma of 14, your list of prepared spells can include four spells of 1st or 2nd level, in any combination. If you prepare the 1st-level spell cure wounds, you can cast it using a 1st-level or a 2nd- level slot. Casting the spell doesn’t remove it from your list of prepared spells. Starting at 2nd level, when you hit a creature with a melee weapon attack, you can expend one spell slot to deal radiant damage to the target, in addition to the weapon’s damage. The extra damage is 2d8 for a 1st-level spell slot, plus 1d8 for each spell level higher than 1st, to a maximum of 5d8. The damage increases by 1d8 if the target is an undead or a fiend. When you reach 3rd level, you swear the oath that binds you as a paladin forever. Up to this time you have been in a preparatory stage, committed to the path but not yet sworn to it. The Oath of Devotion is the only Oath released by Wizards of the Coast as Open Game Content.